One Journal, Many Maps & Many Stories – The Humanities Now! Bucknell University Humanities 100 Course by Katherine Faull and Diane Jakacki is licensed under a Creative Commons Attribution-NonCommercial-ShareAlike 4.0 International License. Moravian Brothers Jasper Payne and Christian Frolich set out from their town of Bethlehem, PA in October of 1747 to visit slave plantations along the Chesapeake Bay. Using ArcGIS to map their travels provides further insight into their journey and is helpful in the sense-making of their experiences. We are able to see what paths the travelers took, the demographics of the areas through which they traveled, and a variety of other things. The travelers took a route along an old Native American trail; opting to navigate trodden paths. The men seem to travel between 10 and 20 miles a day, depending upon the people they encounter. These are not things that are explicitly stated in the travel journals, which shows how crucial the mapping of the story is in getting a fuller picture of what they did and where they went. As so eloquently said by David Bodenhamer in The Spatial Humanities: GIS and the Future of Humanities Scholarship, “GIS is a seductive technology, a magic box capable of wondrous feats, and the images it constructs so effortlessly appeal to use in ways more subtle and more powerful than words can” (17 Bodenhamer). It was very easy to get swept up in the variety of features that GIS could reveal about our precious text. Things that, despite almost a full semester of work with the journal, we never detected. Mapping their journey allows us to not only visualize but also to better understand their journey. The layering feature on ArcGIS allows users to combine a number of different map elements, maps and travel routes. By playing and experimenting with the layers, we are able to put together and combine the different layers in a meaningful way that helps tell the travelers’ story. With all the different layers and features, it becomes clear that the travel diary provides us with not one, but many stories. Depending on the angle and perspective an ArcGIS user decides to take, he or she will come up with a number of different stories to tell, even based on the same transcribed journal. I chose to tell the story of how attitudes towards the travelers changed throughout their journey. In the beginning, the men were cheerfully greeted and welcomed by their Moravian brothers as they visited places with much Moravian influence and presence, as shown in the image below. 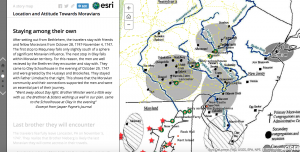 This is a screenshot from my storymap that shows the initial stops of the travelers and that they fall into areas of Moravian influence. As the men left these regions (marked on the map by gray spheres) of Moravian influence, they were met much unkindly, receiving questions ridden with mistrust by skeptical acquaintances. In a way, I am analyzing how the varying cultures of these places impacted the way the men were treated. As Brodenhamer wrote, “More important, [spaces] all reflect the values and cultural codes present in the various political and social arrangements that provide structure to society.” This enforces that the actual spacial locations of the men represent culture and their experiences allow us to make sense of this period in time and the prominent cultures. David Bodenhamer mentions, “Spaces are not simply the setting for historical action but are a significant product and determinant of change. They are not passive settings but the medium for the development of culture.” Mapping the locations of the men with the various filters, allowed me to further synthesize their experiences. It became obvious that location and the spaces and cultures through which they traveled greatly impacted their journey. My story map is just one example of being able to better understand history through mapping. However, there are endless ways in which mapping can add pieces to an otherwise incomplete puzzle. I think it’s cool how we arrived at same conclusion about how far they traveled per day. I think you make a great point about mapping, in that we worked on these journals for a full semester and we still learned so much more about the story from mapping it. You did a nice job on your Map Journal. I like how you included quotes from the journal.